The term solitary nucleus refers to a group of cells in the medulla that is involved in the sensory component of autonomic systems that control visceral organs, such as the heart and lungs. It contains numerous subnuclei, which vary by species and method of identification. Classically the nucleus is divided into five subnuclei defined on the basis of topology as observed with Nissl staining ( Carpenter-1983; click Locus in Brain Hierarchy below.) A more recent segmentation based on multiple criteria identifies ten subnuclei ( Paxinos-2012 ). 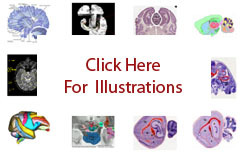 The latter approach identifies eleven subdivisions in the macaque ( Paxinos-2009a ), twelve subdivisions in the rat ( Paxinos-2009b ), and eleven in the mouse ( Franklin-2008 ). An alternate definition ( solitary nucleus (Swanson) ) is based on function in the rat ( Swanson-2004 ) and the mouse ( Dong-2004 ); it excludes the division involved in taste perception and consists of five subdivisions.